The SharePoint 2013 Search Query Tool can be used to query, test and debug, both SharePoint 2013 on-premise and SharePoint online search queries. It’s available free from CodePlex here. 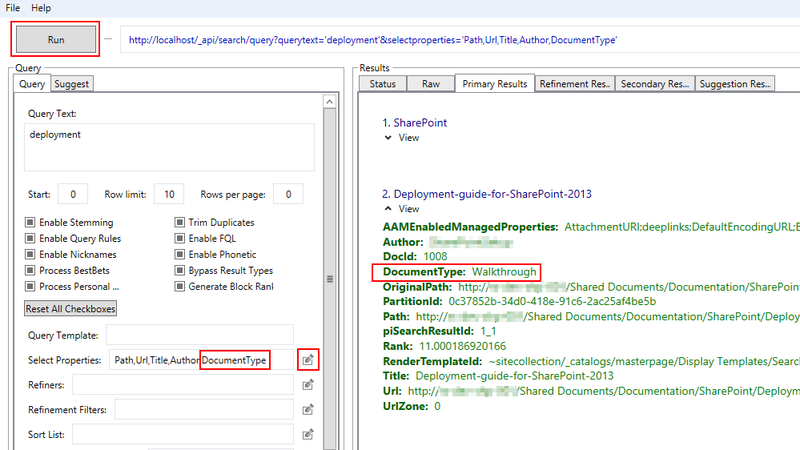 In this post I’ll show how you can use the tool to view a document’s refineable properties within SharePoint 2013 search. For the purpose of this post I’ve uploaded a pdf to a SharePoint document library and applied a metadata value using a column called Document Type. I’ve configured the property to be refineable and it’s visible on the search results page through a managed property called DocumentType. To find out how to do this, see my post here. The SharePoint 2013 Search Query Tool is useful when you need to see what values are held within the search index. Open the tool and enter a search term in the Query Text box. Next, click the push pin next to Select Properties. The Path, Url, Title and Author properties will be automatically added. To show values for DocumentType managed property I added “,DocumentType” to the list (values are comma delimited). Click Run to execute the query, then open the Primary Results tab. For my test document you can see that DocumentType values are now displayed. This entry was posted in SharePoint and tagged CodePlex, Microsoft SharePoint, Search engine indexing, SharePoint, SharePoint 2013 on December 23, 2013 by richardstk. 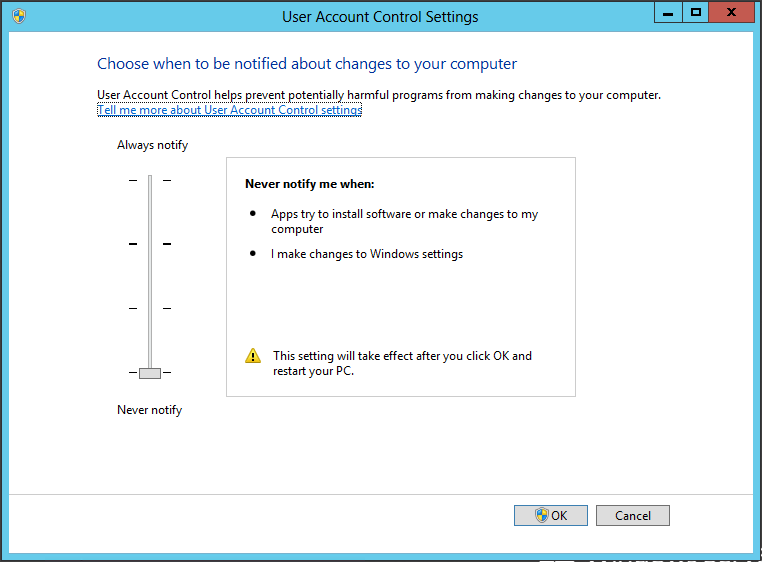 Disabling User Account Control (UAC) in Windows Server 2012 & Windows Server 2012 R2 should be simple; open Control Panel -> User Accounts, click on Change User Account Control settings, select Never notify. The reality is somewhat different. Following the installation of some software, I needed to run a batch file to delete files from multiple drives on a server. Right-clicking the batch file and choosing “Run as Administrator” didn’t delete the files. Double clicking the batch file had the same problem. Disabling UAC through Control Panel didn’t help things. The answer was to set the HKLM\SOFTWARE\Microsoft\Windows\CurrentVersion\Policies\System EnableLUA registry key to 0x00000000 as per the following MSDN article here. Following a reboot, UAC was completely disabled and the batch file worked correctly. I’ve also found the registry change was required to enable the Dell 7.3.0.1 patch for Open Manage Server Administrator to install. Without the registry change I was unable to get the patch to install correctly. This included running the patch with UAC enabled and choosing the option to continue when the UAC prompt popped up, and running with UAC disabled via Control Panel. This entry was posted in Windows Server and tagged Control Panel, Dell, Microsoft, UAC, User Account Control, Windows Registry, Windows Server 2012, Windows Server 2012R2 on December 17, 2013 by richardstk.